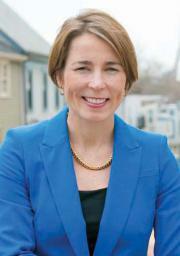 Maura Healey: Called ‘star power’ candidateAt first blush, the odds appeared stacked against attorney general candidate Maura Healey, especially in Dorchester. She was a political newcomer, running her first campaign against a well-known fellow Democrat, Warren Tolman, whose backers included Gov. Deval Patrick, Mayor Martin Walsh, state Sen. Linda Dorcena Forry, and his older brother, union head Steven Tolman. All of which didn’t matter much when voters made their endorsements on primary day. Citywide, the former assistant attorney general beat Tolman by ten points, 55 percent to 45 percent, thanks in part to strong support in Charlestown, Jamaica Plain, and Roslindale. Statewide, her margin was much greater, 62.4 percent to 37.6 percent. In Dorchester, she was edged by Tolman in a majority of the precincts, but in the neighborhood where many believed the well-connected former state lawmaker could count on a sturdy base of support, his win was anything but a landslide. Political observers suggest that the results in Dorchester reflected not so much Tolman’s failure to organize but rather Healey’s success as a candidate, with some venturing to say that she is cut from the same cloth as Patrick and Elizabeth Warren, who were also relative newcomers in their successful runs for office. In Ward 13, which includes Mayor Marty Walsh’s home precinct, 13-10, Healey won five of the ten precincts and tied one. Tolman edged Healey in 13-10, earning 266 votes to Healey’s 181. Paul Nutting was the only Healey volunteer distributing fliers outside the mayor’s polling location, which saw a relatively high turnout of 495 voters, or 30 percent, compared to the citywide average of 16.7 percent. Nutting, a Savin Hill resident and veteran Democratic activist, joined up with the campaign after DotOUT endorsed Healey, who is gay, in late August. Still, he said, he didn’t do much other than stand out at the polling location. Tolman bested Healey in every Ward 16 precinct, which saw turnout in the 30 percent range, among the highest in the city. All 12 precincts’ margins were within 20 percentage points, with 6 of the 12 within 10 percent. The candidates had few significant policy differences, suggesting to some observers that it was their backgrounds that influenced voters. The largely unknown Healey, a former pro basketball player and decorated civil rights advocate who worked to repeal the Defense of Marriage Act, against the well-connected insider Tolman, who had served stints in the House and Senate in the ‘90s. After making it through the February caucuses, Healey’s camp aggressively pursued delegates ahead of the June convention, conducting phonathons in the Sullivan Square campaign headquarters with 45 volunteers and the candidate herself. “As long as they believed she had a chance to win, that she wasn’t a flash in the pan, people were convinced. Over time, that got easier and easier,” Firestone said. Pressley’s support may have lent more help than many people recognize. “I don’t know who all Healey had working for her in Dorchester, but having the highest vote getter in the city [in the 2013 City Council race] and a woman of color in Ayanna Pressley was major for her success,” Ferriabough-Bolling said. For all that has gone on, Healey still has a general election on her hands against the relatively unknown Republican challenger John B. Miller. The prospects are that this “star-power candidate” will be back in the attorney general’s office in the new year, and in charge.